I know it’s tempting to load up your plate and devour everything you possibly can fit into your stomach. Instead, start off with smaller portions and go back for more if you are still hungry. Give yourself about 15 minutes before going for that second round of stuffing, or you could end up feeling like the one who is stuffed. It takes a little bit for your hormones to tell your brain that you’ve had enough to eat. 2. Don’t forget about the healthy foods! Just because I said healthy, doesn’t mean the foods I’m about to list aren’t delicious. Sometimes during the holidays I feel like the color scheme on my plate is a little dull. Macaroni and cheese, stuffing, turkey, gravy…do you get where I’m going with this? Although all of those foods are good, they only consist of carbohydrates, protein, and a little bit of dairy. Adding fruits and vegetables to your plate will not only add color, but a lot of nutrients as well! Some vegetables and fruits that are in season right now are winter squash, cranberries, pomegranates, sweet potatoes, apples, Swiss chard, and kale, just to name a few! 3. Find cool workouts that you can do from home! Even though you might not be able to hit the gym, there are a lot of ways that you can stay active during breaks. 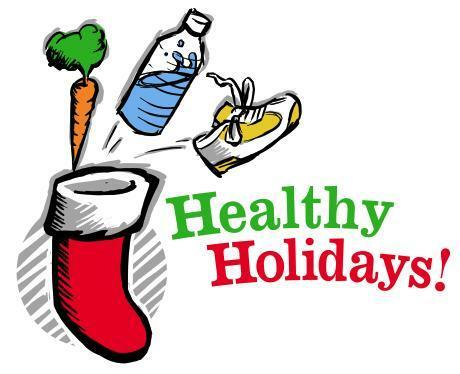 Try some planks, crunches, lunges, squats, jumping jacks, yoga, go for a run, walk your dog, anything to keep your body moving over break! 4. Have a family football game! Or if football isn’t your thing, do something else as a family. Even if that means just taking a walk around the block after your meals, having other people to stay active with will help keep you motivated. You may even inspire other family members to start getting active on a regular basis!